SENTENCE: \\ The term drip edge is a piece of metal placed on the eave of a roof to help control and direct the flow of water into the gutter. It is designed to protect the underlayment and eave. A properly installed drip edge will encourage water to flow off your roof away from the house and not directly down the sides. More commonly, this area is termed “eave flashing” or “eaves flashing”, or “fascia flashing”. The entire area is called the “eave detail”. This includes: the flashing, the folding and termination of roof panels, and gutter (if applicable – as not all roofs have gutters). SENTENCE: \\ The eave overhang is the part or edge of the roof that overhangs the building beyond its side-wall. Eaves help direct the flow of water off the roof; but they also provide climate control for your house. Since windows are the biggest source of heat flow into a house, installing eave overhangs will provide shading and cool the house. On the same note, well-positioned eaves can help ensure you receive sunlight in the winter time as well. Not all buildings have significant eave overhangs, but all light construction does have eaves. SENTENCE: \\ The fascia is a linear, vertical piece that covers the framing between the top of the roof and the soffit (underside) area of rake or eave overhangs. You can also use the fascia to hang gutters along the eaves. The eave fascia and the rake fascia are normally composed of wood and would have a related metal flashing from beneath the roof covering and over the top of the fascia board. The fascia board may be clad with metal flashing or stucco finish too. SENTENCE: \\ Flashing is sheet metal that is used in waterproofing the perimeters and protrusions, valleys and other conjoining or intersecting areas of a roofing system. SENTENCE: \\ The gable, also known as the rake, is the edge of the roof that runs from the eave to the ridge. SENTENCE: \\ The pitch refers to the steepness or slope of a roof – the rise (height) in ratio to or “over” the run (length). A steep slope roof is generally any pitch that is greater than 3:12 also expressed as 3/12. (The roof rises three inches for every 12 inches of run). SENTENCE: \\ The ridge is where the two roof slopes intersect or come together to form a horizontal line. It is this top section that runs the length of the roof, separating the two opposite sides. SENTENCE: \\ The valley is the water-carrying angle where two sloping planes of the roof meet. WHAT PRODUCTS DOES S-5! 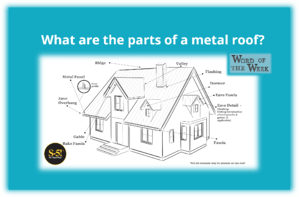 OFFER: At S-5!®, we think every roof should be a metal roof. Durability, sustainability, and versatility are but a few of the reasons metal is at the top of our list. Our line of non-penetrating clamps and exposed fastener bracket solutions means you can attach virtually anything to a metal roof. What attachment solution are you seeking? We offer a variety of snow retention, solar, and utility attachment mounting options. Contact us for help in crafting your perfect solution. Check Out Our Other Words of the Week! Word of the Week: What is PV Photovoltaic Solar Technology? Word of the Week: What is a Snow Guard or Snow Retention?